Welcome to the City of Mayer, a small urban community in western Carver County and home to about 1,900 residents. Please feel free to visit Mayer and see what the community has to offer. and walking trail is enjoyed by residents and many visitors and offers unique and picturesque views of the countryside. The paved trail provides walking and biking access from Wayzata to Lester Prairie in McLeod County. 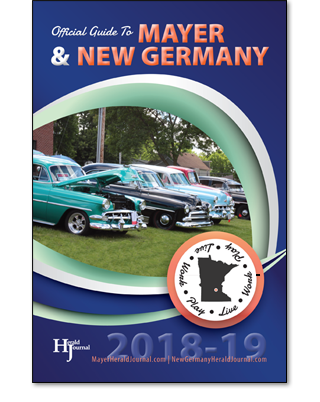 place in July and includes activities for youth and adults, including a car and tractor show. For family and recreational use, there are several community parks with a variety of options and playground equipment. Mayer is also home to a variety of businesses that offer core services for its residents. Mayer is part of the Watertown/Mayer School District; and is also home to Zion Lutheran School (pre-school through 8 grade), and Mayer Lutheran High School (9-12 grade). Volunteers are an integral part of any community and an important part of the City of Mayer. The city is quite often in need of volunteers for various city boards and commissions. A resident only needs to contact city hall to see where they can become involved. The Mayer Fire Department is often in need of members and is another means of volunteering. City council meetings are open to the public and information about the city can be found at www.cityofmayer.com. Inquiries may be directed to the mayor, city council members, or city staff. On behalf of the City of Mayer, welcome to the area and to our community. We hope this guide will assist you in choosing Mayer as a place to call home. It’s a great place to live! Click to view the interactive guide.